How to get there: Pass Shell Garage on entering Dalkey Village. At T-junction turn right and take sharp left onto Dalkey Avenue. Drive to top of hill. Hotel is on left. Further directions emailed on request. The first time I was ever in Fitzpatrick Castle Hotel I was very very young! I was there with my parents to meet the visiting American cousins who naturally, having good taste, came to stay at Fitzpatrick Castle Hotel . Nowadays, I live just a couple of miles away and have always been a frequent visitor at the Castle for dinner, drinks, celebrations, weddings, and meeting visitors. It is just a fantastic place which I know very well and is very much part of the local scene. 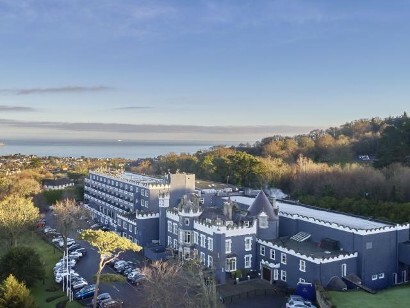 Fitzpatrick Castle Hotel is located in the very much up-market area of Killiney, on the south County Dublin coastline overlooking Dublin Bay. Located majestically on a height close to Killiney Hill and nearby Dalkey village, I suppose you could say it is the Beverley Hills of Dublin! There is enough Botox in the area anyway!! During your stay at Fitzpatrick Castle you will have Bono and Ali, amongst others, as your neighbour for Killiney and Dalkey are magnets for Ireland’s glitterati. Go up the nearby Vico Road and you could be in Sorrento. Sit out at many of the Cafes and bars of Dalkey village and you will feel you are on the Meditteranean. Fitzpatrick Castle Hotel was started by Paddy and Eithne Fitzpatrick who were spectacularly good hosts and renowned hoteliers. Hospitality is a quality you cannot buy and they passed this gift on to their children who now each run terrific hotels in Ireland and New York. Their daughter Eithne Fitzpatrick Scott Lennon, and her family, are at the helm of this 18th century Irish Castle which started out this hotel dynasty, and she always moves forward keeping ahead of the times. Furnished with exquisite taste, nothing is left to chance in the pursuit of excellence and attending to your comforts. Bedrooms are equipped to suit every type of guest be it leisure or on a business trip. There are suites with spectacular views over Dublin Bay, and executive rooms with desks allowing plenty of workspace, as well as Front Deluxe Rooms with balconies, allowing you bask outside and take in the spectacular views. There are three excellent dining options - PJ’s Restaurant - styled in keeping with the traditional Castle environment; Mapas Restaurant - in the oldest part of the Castle - now a sleek hip minimalist spot doing excellent and imaginative contemporary food. The third option is The Library Bar which boasts Killiney’s best frozen Daiquiris - there is also an evening bar menu here but whichever option you choose, the food and craic is always cracking. As well as all that there is a Leisure Centre with a 22 metre indoor pool, a fully equipped gym and an on deck whirlpool spa and Scandanavian wood sauna and steam room, plus a beauty salon providing aromatherapy, reflexology or a soothing massage. Oh, and there are great shops and galleries nearby plus Golf Clubs galore.